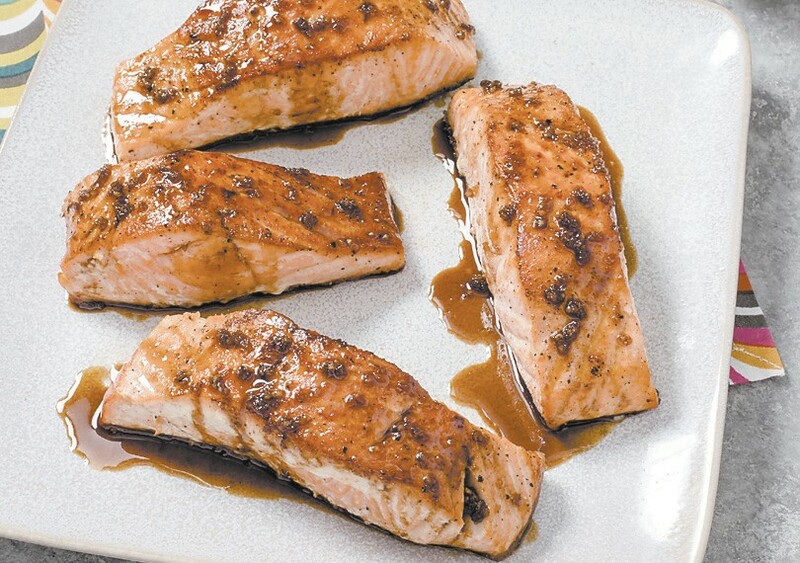 This photo provided by America’s Test Kitchen shows Sweet And Tangy Glazed Salmon. Starting salmon with the skin side down in a pan is a neat way to cook fish. The skin protects the fish from drying out. The skin also releases fat into the pan, which is then used to cook the second side until it is golden brown, no extra oil needed. To help keep the fish from sticking and allow the fat to puddle under the fish (and not just around it), sprinkle a thin layer of salt and pepper over the cold pan before adding the fish. And make sure to use a nonstick pan. In a 12-inch nonstick skillet, sprinkle 1/4 teaspoon salt and 1/4 teaspoon pepper in even layer. Place salmon fillets, skin side down, in skillet. Wash your hands. Sprinkle tops of fillets with 1/4 teaspoon salt and 1/8 teaspoon pepper. Use tongs and spatula to carefully flip fillets. Cook, without moving fillets, until center of each fillet registers 125 F on the instantread thermometer, 6 to 8 minutes. Turn off heat. Transfer fillets, skin side down, to serving platter. Cover platter with aluminum foil. Chef’s Note: To flip fish, gently slide spatula under fish to loosen skin from skillet, then use tongs to flip fish. Nutrition information per serving: 326 calories; 112 calories from fat; 12 g fat (2 g saturated; 0 g trans fats); 109 mg cholesterol; 691 mg sodium; 16 g carbohydrate; 0 g fiber; 13 g sugar; 38 g protein. America’s Test Kitchen provided this article to The Associated Press.